Hello. 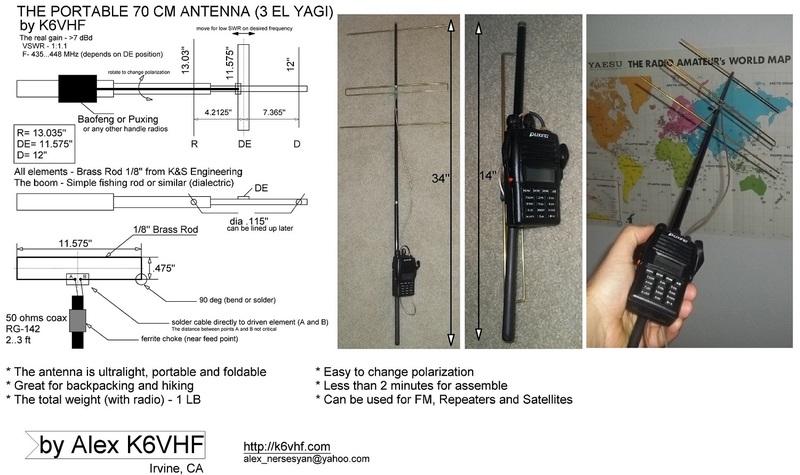 I want to share one of my recent projects – 3 el yagi for 70 cm band. It’s very light, portable and great for backpacking or hiking. I like hiking a lot so to have the necessary equipment is important. For HF bands I have IC-703+ and set of J-pole antennas. Many HAMs use a small handled VHF/UHF radios but unfortunately the original antenna is very bad and not efficient. It cause bad communication or radio overheating. I decided to make one antenna that I can handle and have with me every time when I hiking or backpacking. Finally I found a solution and made this antenna. It met all my criteria. 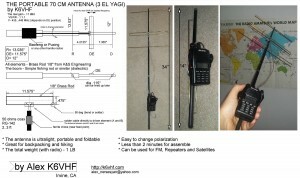 I got a ultralight, foldable and portable pocket size antenna with decent performance. Frequency: 436.00 – 445 MHz with SWR 1:1.5 – 1:1:1.5 and 1:1.1 on 440 MHz. from 1/8″ (3.18 mm) brass rod. You can find them from K&S Engineering store. Simply drill a two holes, one for reflector another for director. The driven element can be just zip tied to the boom. The important step is tuning. At least you have find a position of driver element whenever you get a lowest SWR on central frequency (the antenna can be tuned ether for SSB or FM). Personally I use this particular antenna only for FM, repeaters and satellites. As you can see on photo, I’d attached my cheap chinese radio directly to the boom. Download in high resolution here in PDF.